Solar panels absorb light and convert it into direct current power (DC). The power inverter changes direct current to alternating current (AC). The alternating current is then routed to the grid for storage. You will then be able to draw it from the grid into your house as it is needed. 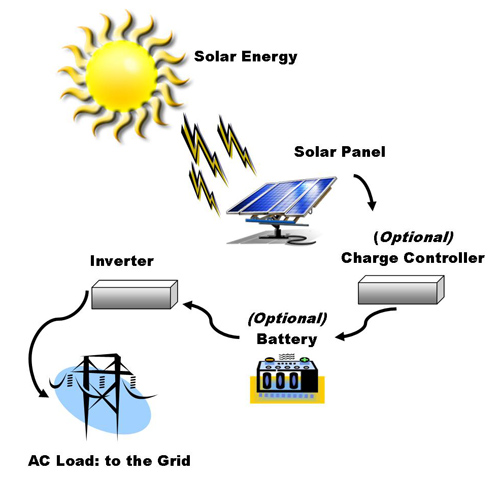 Photovoltaic (PV) Arrays – (i.e. solar panels)--Array of solar panels that absorb light produced from the sun and converts it to direct current (DC) electricity, the same type of electricity that a battery or a car produces. Inverter - The direct current (DC) power is then transferred to a module called a power inverter that converts the DC to alternating current (AC), the same type of electricity that we use in our homes and buildings. Revenue Grade Meter - This meter tracks the exact amount of electricity that your system produces and how much you use. Utility Grid - Your building will remain connected to the grid in your area where the electricity you produce will be stored. Electricity is drawn from the grid during the day when you need it, as well as at night when your system is not producing electricity.